I love this quote. How very, very true. Cooking is indeed, love made visible. This one-pot Dublin Coddle is such a simple and delicious meal. It's the perfect recipe to gather everyone together around the table, to show and share some love this season. It's comfort food at it's finest, friends! My mom used to make this every year in the fall; Dublin Coddle was a bit of a tradition in our home. Though she is no longer with us, her tradition lives on each year, in my own home. Hi friends, how have you been? I hope you've all fared well through the back-to-school frenzy! This summer was enlightening in many ways. Lately, I've been mindfully trying to take in the little moments with my family. Being fully present is hard in today's world. With all of the technology and distractions at-the-ready, it's important to put it all in it's place from time to time and focus on what's really important; each other. For us, family dinner time and family gatherings have become a mecca of unplugged togetherness. No phones, no computers, just good conversation over great food. 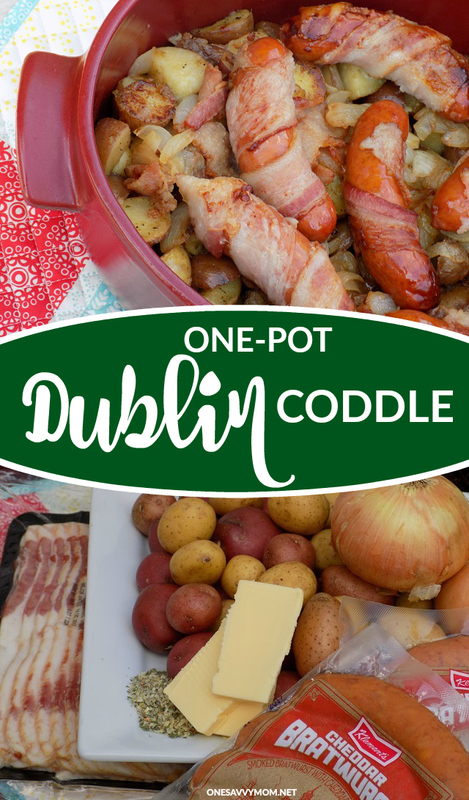 This past weekend, I pulled out my dutch oven, and my electric smoker, and made this one-pot Dublin Coddle for my family (you can easily make it in the oven as well). 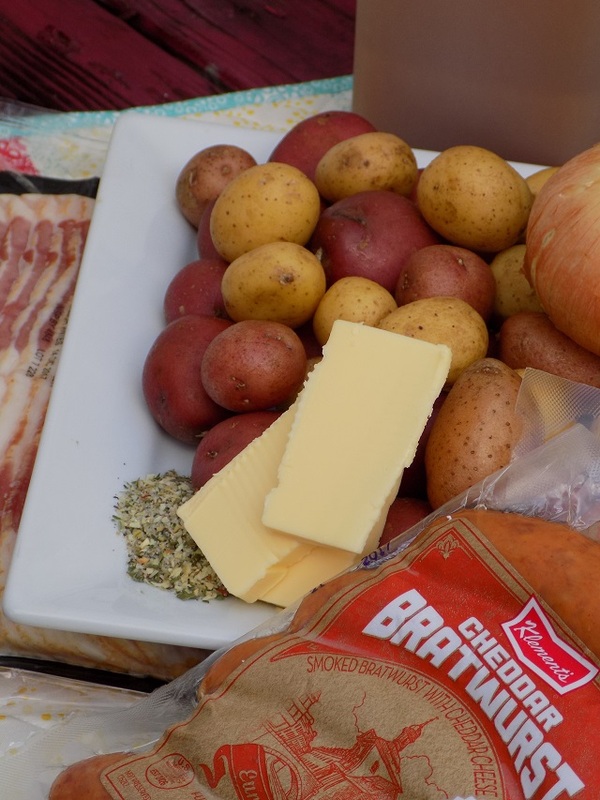 The recipe is easy to assemble, and only requires a few simple ingredients (Klement's Fully Cooked Smoked Cheddar Bratwurst, bacon, potatoes, onions, butter, apple cider, and some simple seasonings)- definitely my kind of recipe! When this deliciousness was ready, we all headed to the backyard to enjoy a few friendly games of checkers while we chatted and ate. It was the perfect traditional unplugged start to our Fall season. Read on for my full recipe for one-pot Dublin Coddle, below. Slice onions (thin). Set to the side. Chop 4 strips of bacon. Set to the side. 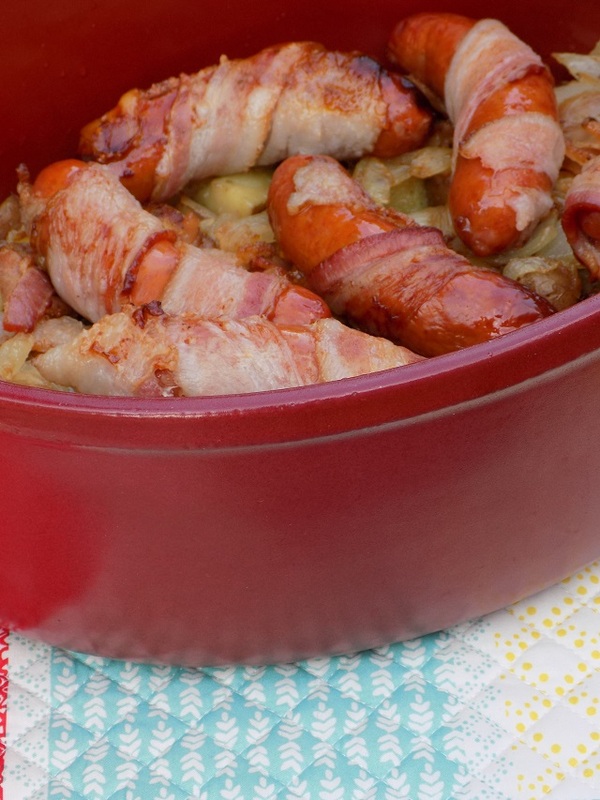 Use remaining bacon to wrap each Klement's Cheddar Bratwurst Dinner Link. Set to the side. 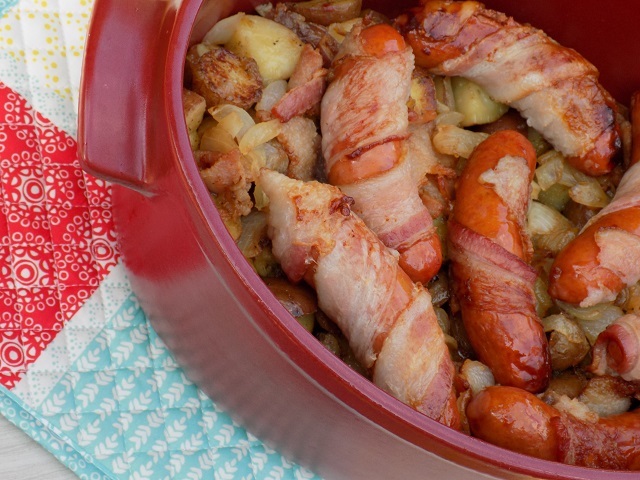 In your dutch oven (or oven safe pot/dish with lid), combine potatoes, onions, chopped bacon, and seasonings. Use a spoon to evenly combine ingredients. Next, place your bacon wrapped Klement's Cheddar Bratwurst Dinner Links on top of your seasoned potatoes, onion, bacon mixture. Now, pour your apple cider evenly over top. Add your divided pads of butter evenly to the top. Place lid on top and place in your preheated oven at 350 degrees (F.) for 35 minutes. Remove lid, bake for an additional 10 minutes. Remove from oven, allow 10-15 minutes for cooling prior to serving. Enjoy! With four kids in the house, I'm not even going to lie friends, our household is very busy these days. While I don't always have a ton of time for dinner-prep, ingredients like Klement's Sausage help me pull together delicious family recipes in a cinch; to keep the family traditions on-going! 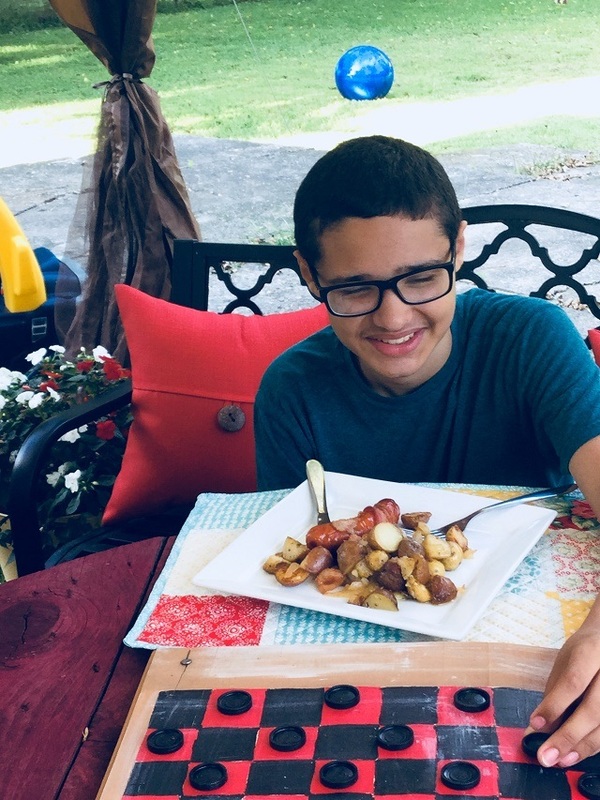 Their traditional authentic European hand-crafted small batch products add robust flavor to this family-favorite recipe our ours, while also allowing me plenty of time to slow down and savor the little moments with my kids. It makes my heart happy to think ahead to years from now, when they will share these family traditions and recipes, with their kids. Wishing you all a season filled with great food, shared with the ones you love most. Happy cooking and happy Fall, friends!